Isn’t nature interesting? 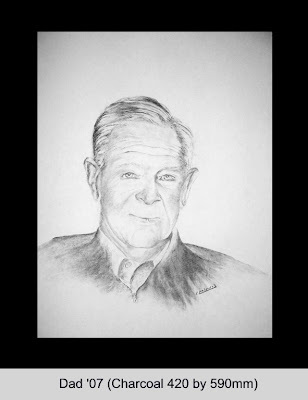 If you look at some of my earlier posts you will see a pencil drawing of my late father and a couple of charcoal portraits of his grandson, my son. I am posting a new charcoal portrait of my Dad as part of this post and I’m busy with an acrylic based on the same photograph. Drawing a portrait concentrates your mind on those characteristics, which make a face unique. It was a fascinating discovery and a strangely emotional experience to find myself drawing the same lines on the forehead and around the mouth; shaping the same crooked smile and battling to get that ear right. Amazing!